If you had been wondering whether the Omlet newsletter was a figment of your imagination, produced bi-annually or rarer than a full set of hens teeth you’re in for a nice surprise! From now on you can look forward to a whole host of goodies. Every week, Barbara our chicken expert will be handing out topical tips and advice, you can catch the lastest forum gossip and of course all the Omlet news and special offers. We hope you enjoy it. Q: What do you call a mischievious egg? It didn’t last long but the spell of hot weather certainly had an effect on my chickens the other week. While it was lovely for dustbathing, the girls found they were beginning to overheat during the afternoon and stood around panting and lifting their wings to cool themselves down. When the days are hot, it is vitally important to make sure that they have plenty of fresh water to drink because they can dehydrate rapidly and to provide somewhere shady for them to rest when things get too hot. It’s a good idea to keep the water in the shade so that it doesn’t warm up too much as well – chickens don’t like drinking warm water! 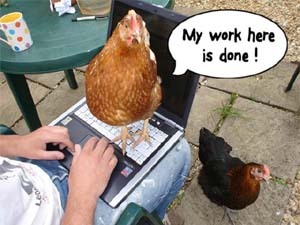 Finding the right work / chicken balance is always hard! A visiting guest to the forum asked about adding Omega 3 to the chickens’ diet…..
What could be better than walking to the bottom of your garden and collecting the freshest eggs every day courtesy of your own hens? This is the fastest selling chicken book on Amazon, and has been their number one pet book for the last three months reaching number 258 in the overall book rankings at one point! Infact people who bought Harry Potter also sometimes bought this book! Beyond all the hype its a brilliant new guide to chicken keeping showing just how simple it is to enjoy the pleasure of raising chickens. It’s fun and it’s rewarding – and the added bonus is that chickens come with a lifetime’s supply of free eggs. They make great pets – low-maintenance and easy-going, a pair of chickens will thrive even in small urban gardens and backyards.